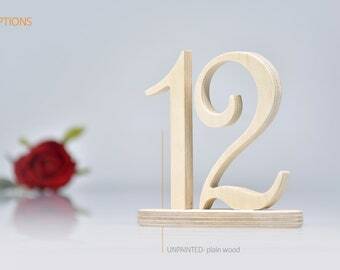 Wedding table NUMBERS - numbers tall 5,2" in total (numbers 5" tall + wooden base cut of 1/2" plywood) - please see the dimensions on the preview - image 4 in the listing. 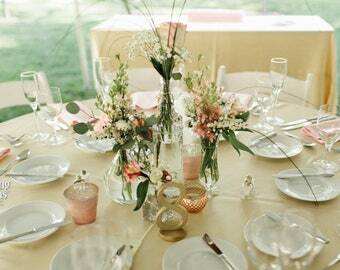 Great for Reception, Wedding, Party, Anniversary, Birthday - perfect for any special event! Once I ship the package Etsy will send you a shipping notification with the TRACKING NUMBER, so you will be able to check where the package is at any given time. IMPORTANT: The delivery requires a SIGNATURE! Please keep in mind that if the postman couldn’t find anyone on the address to sign for the package they will keep it in the nearest post office. If you need a bigger, or smaller set that you don’t find in the listing options, just contact me and I will create a listing according to your needs. 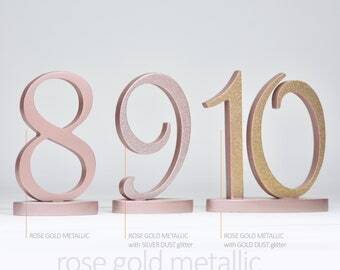 •	SILVER DUST* – the numbers are painted in a color of your choice and then silver spray glitter is applied on the FRONT of the numbers. 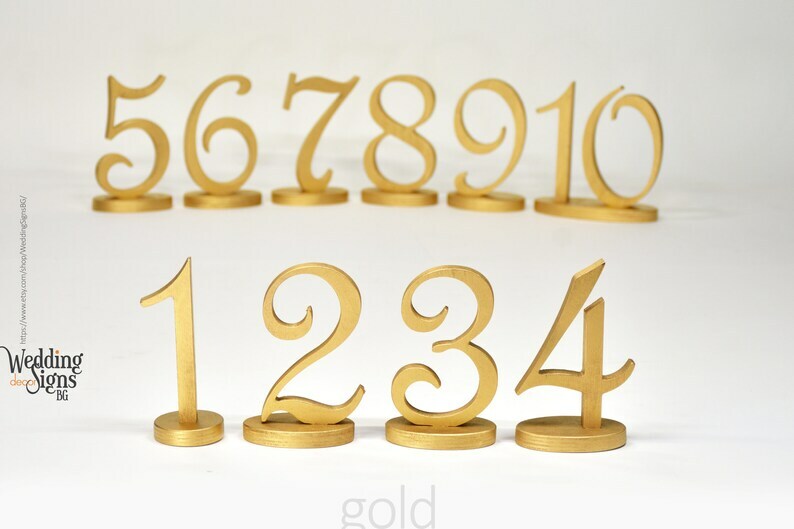 •	GOLD DUST* – the numbers are painted in a color of your choice and then gold spray glitter is applied on the FRONT of the numbers. 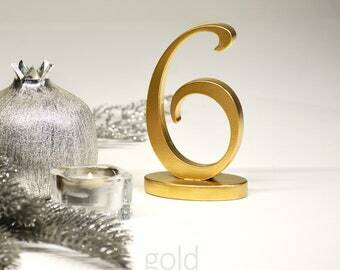 * Our SPRAY GLITTER it’s very soft and elegant and it doesn’t fall off. 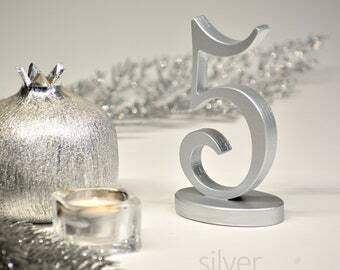 Thank you for viewing my shop and welcome back! Turned out so perfect! Great size, should be super easy to paint. Thanks so much!! highly recommend! Communication was quick and easy! Received my table numbers in record time for my wedding! They look exactly like the picture! 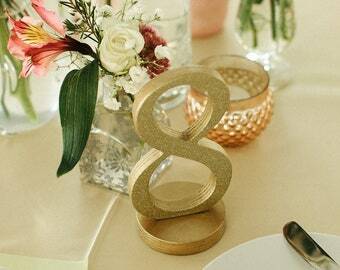 These gold table numbers are exactly what we wanted for my bridal shower and wedding decor. 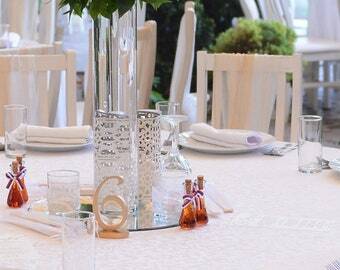 Very good quality, light weight, sturdy and beautifully painted. Shipped on time and arrived in perfect condition. Svetlana was a pleasure to work with! Highly recommend ordering from this shop!! Can I receive the package without a signature requirement? All the packages are shipped with a SIGNATURE REQUIREMENT - this is a guarantee that the package will be delivered to you and it won't be lost, or stolen. If you happen to arrange a delivery without a signature, by agreeing the package to be left at front door, etc, you give up this guarantee. Therefore, if the package is lost, or stolen, I can't make a refund to you.